NOTE: Content was written on 11/4 and posted 11/7. Certain events already took place. I hope everyone is ready for winter. It is coming. We had our first snowflakes of the season last Friday along with massive waves on the lakefront which ruined the walking path. Pending Home Sales: 0.3% vs. 1.0% est. Pending home sales are a noisy number to follow, but there was an interesting piece of information within the information. According to the real estate agents who were surveyed for the index, approximately 15% of the deals they were involved with did not close due to the buyer not being able to secure lending. Credit remains tight, however, there are signs we could see looser practices coming. Two weeks ago, regulators decided to remove a requirement for a 20% down payment in order to obtain a high-quality mortgage. Fannie and Freddie followed with an announcement that buyers could obtain lending for as little as 3% down. Hopefully the mortgage industry can contain itself this time around and not offer no money down, no proof of income loans. Housing prices continue to moderate as the industry recovers. 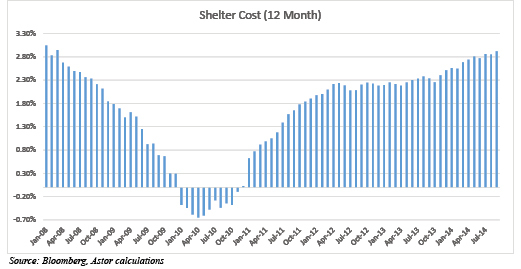 Monthly changes in the 20 city Case-Shiller composite have fallen sharply since March. The YoY change falls lower as each month passes, which means we are out of the bottom zone and will likely not see double digit gains in the future. As long as employment stays healthy, wages inch up, and lending loosens; softer prices should bring more buyers to the table. 2. Durable Goods: -1.3% vs. 0.5% est. The headline number paints a worse story than the underlying data. Excluding the transportation sector, orders slipped 0.2% in September. The majority of the top level decline was attributed to a 3.7% decline in transportation orders. Business investment was weaker (-0.2%) so we will keep an eye out next month to see whether the trend is reversing or if spending cooled off after large increases earlier in the year. Growth on an annual basis appears to be strong. For now, we will consider the trend to be intact. We are starting to look a lot better on an annual basis than we thought we would, especially given Q1’s issues. We still are stuck in the low-2% YoY growth environment though. The last two quarters certainly help to bring us up to this level from where we stood in the spring but how do we move past it? QE ended and the global economy is consistently shaky. Where do we go from here? The U.S. economic engine appears to be catching its wind again, but it has been a slow and painful process. Q3 experienced growth from personal consumption, exports, and government spending. Inventories negatively contributed which was expected after a 1.42% increase in Q2. Chicago PMI: 66.2 vs. 60.0 est. – Manufacturing looking strong! If you pulled a Chicken Little on October 15th, you’ve probably had to blink twice last week if you looked at the S&P 500 Index’s closing price for the month. October was one of those months you should have only looked at the first day and the last day. If you paid too much attention to the in-between, you might have panicked. What appeared to be a straight shot down mid-month turned into a month of almost 2.5% in gains for the Index. On absolute point basis, the S&P 500 took a 150+ point dive to the lows and then recovered nearly 200 points to give a open-low-close range of around 350 points. In a reverse course of the action seen most of the year, small caps lead the way with mid caps and then large caps trailing behind. The Russell 2000 Index (i.e. small caps) flew to a 6.5%+ return on the month to bring the gap between large and small cap stocks to a much narrower 8.3% from a high of 12.6% reached early in the month. The question to answer now is “Why did we rally?” There are plenty of reasons to give here and I would not feel comfortable pinpointing a specific headline or event. Corporate earnings were good, Japan looks to be entering into more stimulus, the Fed here seems to still be on course for a mid-2015 rate hike, news from emerging and developed markets were better, investors bought the dip, etc, etc. A good chunk of the data is already out for the week but many reports remain on the schedule. 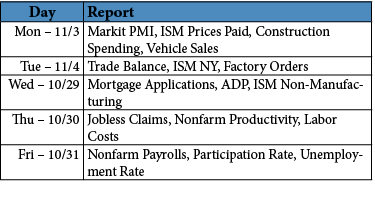 Nonfarm payrolls will be a big focus on Friday as well as other employment numbers (wages, participation rate, etc.). I doubt we will see runaway wage inflation, but the market is jittery right now when it comes to rates so there are a lot of eyes on those types of numbers. ISM Non-manufacturing will notch another month above 50 and get closer to 60 consecutive months in expansion territory. A week of muted price movement would do us all well. I think we could use a breather after October’s wild ride. Time to reset, look to the future, and move forward with what is increasingly looking like a solid domestic economy. Keep a watch out for the dispersion between large, mid, and small cap stocks. We are firm believers of mean reversion here. Large caps could pull in or stay flat while smaller company stocks move higher. Fears about a higher USD impacting earnings for large multi-national companies will continue to give reason to buy small. Halloween is here! There are a few more days to buy candy, carve a pumpkin, and figure out what costume to wear. Hope everyone has a safe and fun time on Friday. 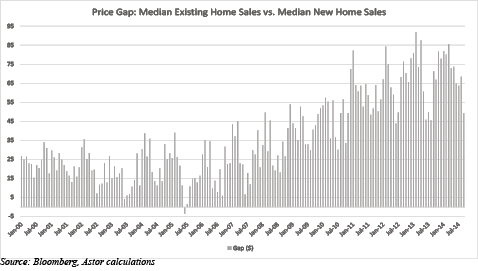 Existing Home Sales: 5.17M vs 5.10M est. New Home Sales: 467K vs 470K est. News from the housing market continues to stir mixed emotions. Existing home sales increased to the highest annual rate for the year while new home sales barely squeaked out an increase off a lower than previously reported number for August. All cash deals and investor purchases ticked up a bit in September but remain lower than in 2013. In the various regions, the Midwest was the weakest with a decline of 5.6% while the West shot higher by 7.1%. Home buyers received an unexpected gift this year as rates fell nearly back to levels seen late last summer. Additionally, lenders are starting to relax standards ever so slightly. As prices rise, sellers will continue to enter the marketplace and investors will exit when distressed properties become more scarce. New home sales took a breather after shooting higher in August and only remained positive due to a nearly 40K downward revision. Inventory levels over the last three months are better after dipping to a low of 4.4 months supply in May. Builders seem to be focusing less on building fewer more expensive homes (which has kept prices elevated). Median prices sank from $286,800 in August to $259,000 in September. The number of new homes sold for less than $200,000 accounted for 31% of the total last month compared to an average of 23% for the year. Housing will reach a better balance when existing home prices edge up, new home prices compress, and supply of both are higher. The price gap stands at ~$50,000. Looking at Figure 1, you can see the gap has been stubbornly high in the last few years and well above the average level seen in the last housing boom. The Journal has a cool housing market tracker worth checking out. In his famous song, “Mama Said Knock You Out”, the 90s rapper starts the song by saying “Don’t call it a comeback.” Last week looked like a comeback to me. Across the board, equities broke out of their bottom ranges and ended the week in a nice shade of green. Corporate earnings and upbeat economic data from aboard helped give a boost while fears of Ebola in the U.S. and shootings in Canada caused a few jitters. Another month is about to end and 2014 is drawing to a close. We will see our usual dump of month-end economic reports this week, although some will hit the wires early next week (e.g. ISM Manufacturing). More consumer oriented data is on the docket as well so let’s hope our fellow citizens kept their wallets open for another month. I do not expect the Q3 GDP release to be a shocker on the downside and I think I speak for most when I say I hope to see a three handle. Chicago PMI will be a precursor to ISM next week. We are all awaiting data current enough to show whether the rising dollar and drop in eurozone growth are negatively impacting the domestic economy. The trajectory seems to be up for equities with volatility (as measured by the VIX) collapsing from highs reached two weeks ago. It is too early to say we are going to sustain these levels as the possibility of a test of lows is always in the works. The recent sell-off took us out of the trend channel when looking at a longer dated chart, but the bounce back has been sharp. A resumption of the prior trend too early would do little to quiet the bears in the crowd. Sometimes we get too caught up in the charts and the history instead of thinking about the why and the now. The difference between a chart looking good or looking bad could simply be a matter of scale or the time period selected.